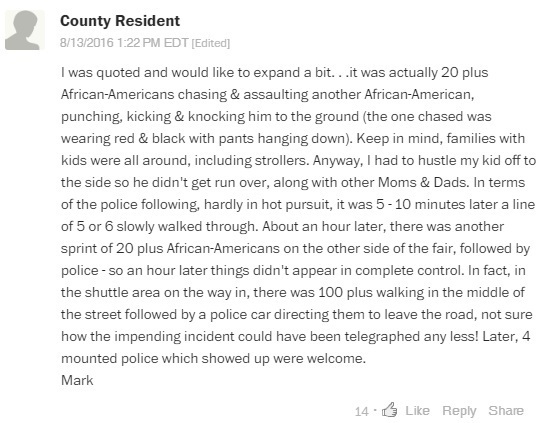 A Washington Post writer sent to report on a triple stabbing at an Agricultural Fair in the multicultural haven of Montgomery County, Maryland had her report sh*t on in the comments by the witness she quoted in the article. Three people were taken to a trauma center Friday after a fight between two groups at the Montgomery County Agricultural Fair. About 10:40 p.m., officers came upon the groups fighting, police said. Everybody ran except for three people with stab wounds, which police said were not thought to be life-threatening. […]Mark Fennel, who was at the fair, said he saw several dozen young men sprinting through the main throughway, followed by police. The article is short, read it yourself, I cut none of the relevant information out. Mark Fennel, whom she quoted, went and posted in the comments what actually happened. This is why leftist news sites across the web are shutting down comment sections entirely — despite it destroying their communities and lowering their readership and revenue. Readers debunk their their BS narratives at light speed!